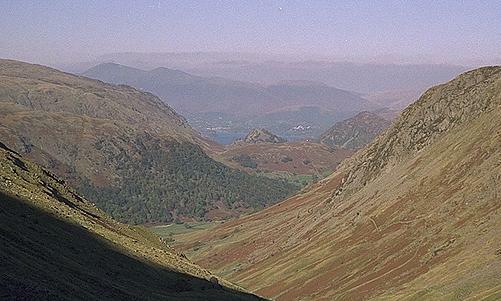 Beyond the wooded slopes of Lowbank Crags lies High Scawdel, dropping down into Borrowdale. Skiddaw appears in the distance. In the centre of the picture the isolated Castle Crag splits our view of Derwentwater and Grange Fell appears on the right. Closer to the viewer, on the right, Capell Crag overlooks Seathwaite..